WTF – Judd Nelson’s own slasher movie series!? Well, nearly… He got to do two of them. For TV. Director: Po Chih Leong / Writer: C. David Stephens / Cast: Judd Nelson, Hedy Burress, Michael Weatherly, Susan Gibney, Bernie Coulson, Colleen Wheeler, Cam Cronin, Bob Dawson, G. Patrick Currie, Daniella Evangelista. Director: Po Chih Leong / Writer: Jeffrey Reddick / Cast: Judd Nelson, Dahlia Salem, Brian Krause, Andrew Moxham, Natasha Wilson, J.R. Bourne, Claudette Mink, Emmanuelle Vaugier, Daniella Evangelista. Judd Nelson, one time poster boy of The Brat Pack in the 1980s, is Stanley Caldwell, a rather dry-witted screenwriter who is penning a script for a teen slasher film and enjoys tormenting the expectations of his pushy agent, Regan, and the prissy director, Logan. 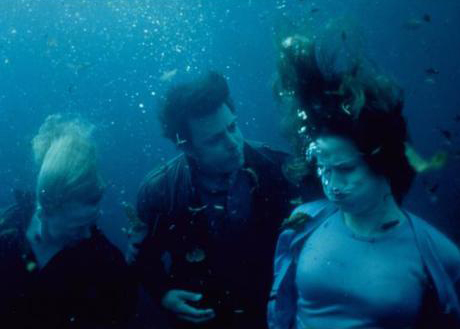 In order to research his grim tale, Stanley has taken to abducting young women from Los Angeles, imprisoning them in his lakeside cabin for days while he makes notes on their failing psychoses and eventually weighting them and drowning them in the lake. The local cops pin up new missing persons’ posters and thank their lucky stars it’s all happening in the city and not in their dozy town, which extraneously houses a small film community, including a trio of special effects techs. During a dive to test some new camera work, down comes a new weight with most recent victim Mallory (Burress) tied to it. 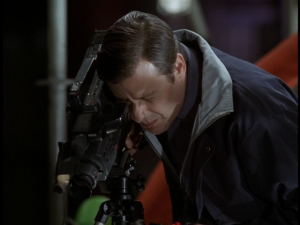 They, along with a pre-NCIS Michael Weatherly as the requisite handsome deputy, rescue the girl and create a mold of her face with cameras in the eyes to put in place of her body for the killer’s return to ‘tend his garden’ of drowned princesses. The plan fails, Stanley somehow manages to abduct Mallory a second time while other people work out some obvious clues and come to the rescue, tying Stanley in place of his chosen victim. 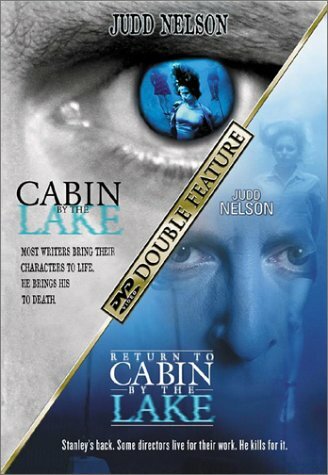 While it only functions as a slasher film for some parts and doesn’t show even a splash of blood, Cabin by the Lake isn’t a totally lost cause. Nelson, who had already played an unhinged psycho killer in Relentless back in the 80s, makes for an interesting maniac, while Burress takes the final girl role in her stride. In Return to…, Stanley’s back (and carrying a bit more weight), last seen at the end of the first film lunching with a new agent and sporting a bad wig, and his crimes are now being made into the film he was writing both literally and figuratively. Production is hampered by an egotistical director, bimbette actresses willing to sleep their way to the best roles, and a mob of protesters led by the brother of one of Stanley’s victims. He mingles in the background for a while and eventually offs enough bystanders to become the new director. He takes pity on the downtrodden screenwriter (Salem) and soon wins her favour until her research uncovers more than he wanted her to know. It’s deja vu as far as most of the story goes, with standard in-jokes around making a slasher film based on ‘true events’ that bring back flashes of Cut, Scream 3 and Urban Legends: Final Cut, to name but a few of the many other films that have toyed with the same premise. Possibly even tamer than the first one, this could almost be a family movie, cheapened by some naff looking slo-mo and the inconsequential he’s-still-out-there ending, but, again Nelson’s manipulative charm and array of bizarre disguises rescue this one from drowning as well. Curiously only this one ever made it to DVD in the UK. You could do worse than this pair of after-school-esque films, probably perfect for a 12-year-old’s sleepover but as Stanley’s agent advises, it could do with a few decapitated heads and chopped off limbs. Blurbs-of-interest: Judd Nelson was later in The Caretaker; Hedy Burress was in Valentine; Emmanuelle Vaugier and Daniella Evangelista were both in Ripper: Letter from Hell, and Vaugier was also in The Fear: Resurrection; Claudette Mink was in Children of the Corn: Revelation; producer Neil H. Moritz also produced the I Know What You Did Last Summer films and the first to Urban Legends.